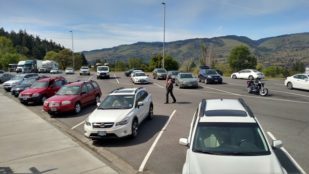 Oregon’s public rest area system has a lengthy history of welcoming travelers and providing safe clean facilities for motorists to refresh. At OTE managed rest areas, dedicated employees provide a range of services. From helping families find lost keys and pets to ensuring that the grounds are free from obstructions and hazards, our specialists are present during peak travel hours, seven days per week and on holidays. (1) Lighting a fire of any kind, other than propane or gas fueled camp stoves and grills. (2) Picking, removing, or damaging plant life or forest products. (3) Hunting, trapping, or injuring birds or animals. (4) Discharging a firearm, bow and arrow, or other weapon or discharging fireworks, explosives, or other similar devices. (5) Mutilating, defacing, damaging or removing any property, garbage, recycling, structure or facility. (6) Digging up, defacing, or removing any dirt, stone, rock, or other natural substance. (7) Operating a concession or selling merchandise, food, or services, except for a permitted “free coffee” service, public telephones, or articles dispensed by vending machines pursuant to an agreement with the Department of Transportation, or Travel Information Council. (8) Blocking or physically interfering with access to the restroom by other Visitors or blocking motor vehicle or pedestrian movement in the Rest Area. (9) Smoking or carrying a lighted cigar, cigarette, pipe or other smoking implement in a restroom building or within 20 feet of a restroom building in the Rest Area. (10) Consuming any alcoholic beverage or possessing an opened container of an alcoholic beverage within the Rest Area. (11) Operating a motor vehicle in any area not constructed or designed for motor vehicles. Parking a motor vehicle outside the designated parking area or parking in violation of any posted parking regulation. (12) Allowing a pet or other animal to run loose. All pets and Service Animals must be on a leash 6 feet or shorter and under direct hand control. All livestock must be on a lead of 10 feet or shorter and under direct hand control unless contained within a designated livestock corral. (13) Allowing an animal, except a Service Animal, to be in any building or in any area except designated pet or livestock areas. (14) Placing a poster, flyer, sign or other marker in or on any utility pole, sign post, building or other facility in a Rest Area. (15) Depositing garbage, recyclables, or refuse of any kind except in designated containers. (16) Dumping, spilling or allowing to leak any sewage, waste water, or other substance from the vehicle. (17) Using restroom facilities to bathe, or wash clothing, dishes or other materials. (18) Setting up a tent or other structure, camping, or remaining in a Rest Area for more than 12 hours within any 24-hour period. (19) Participating in a public disturbance, or riotous or other behavior which interferes with the reasonable use of the Rest Area by other Rest Area Visitors. (20) Obstructing, harassing or interfering with a Department of Transportation or Travel Information Council employee or Rest Area Attendant in the performance of their duties in the Rest Area. (21) Creating noise by any means which interferes with the reasonable use of the Rest Area by other Rest Area Visitors. Download a PDF copy of the rules (including information on rest area rule compliance and violation-citation) or visit the Oregon Secretary of State OARs website to read the complete rules online.